On June 3, after the prayer service at the Petraki Monastery, the Primate of the Russian Orthodox Church attended a grand meeting of the Holy Synod of the Orthodox Church of Greece. The members of the official delegation accompanying him also attended. His Beatitude Archbishop Hieronymos of Athens and All Greece welcomed His Holiness, saying that his presence in this hall was a special blessing and great privilege. 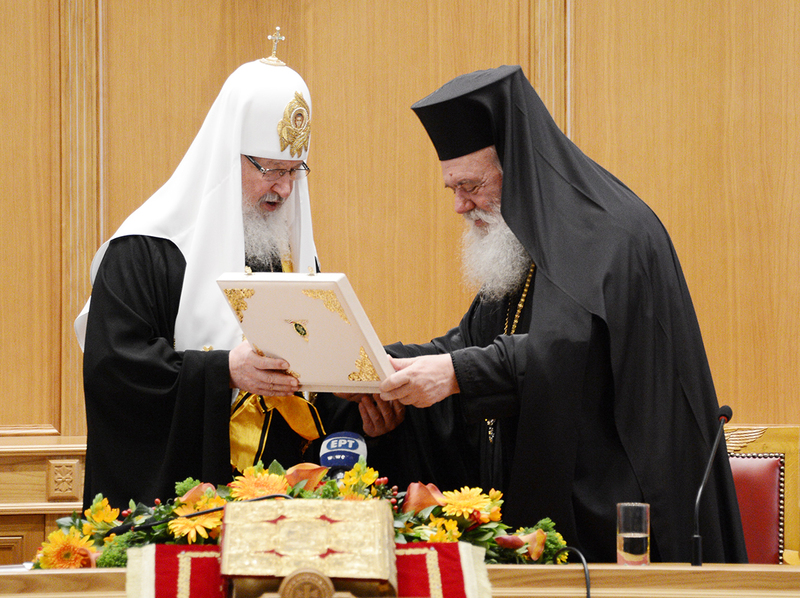 The highest award of the Orthodox Church of Greece, the Grand Cross of St. Paul was conferred upon His Holiness Patriarch Kirill of Moscow and All Russia by the decision of the Holy Synod of the Orthodox Church of Greece. Bishop Gabriel of Diavlia read out the decree, and His Beatitude Archbishop Hieronymos handed in the award to the Primate of Russian Orthodox Church. Axios was sung. His Holiness Patriarch Kirill addressed the permanent members of the Holy Synod and donated panagias to them. Clerics of the Church of Greece received pectoral crosses and medals issued for the enthronement of his Holiness Patriarch Kirill.